Search And Rescue Suspended For U.S. Marines In 'Mishap' Off Australian Coast : The Two-Way Most service members were rescued, but three remain unaccounted for after their aircraft "entered the water." On Saturday, the U.S. Marines said three service members were missing after an MV-22 Osprey, like the one shown, "entered the water" off the coast of Australia. Updated at 10:15 p.m. ET. The U.S has suspended its search for three Marines who are missing after an MV-22 Osprey from the 31st Marine Expeditionary Unit "entered the water" Saturday off of Australia's east coast. The III Marine Expeditionary Force said that following a "mishap," 23 out of 26 personnel aboard had been rescued. 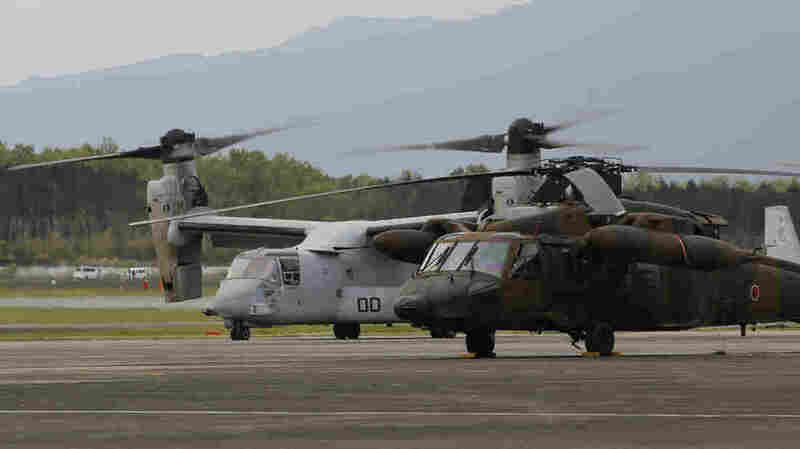 The Navy and Marine Corps suspended search and rescue efforts for the three remaining Marines as of 4 a.m. local time on Sunday, the expeditionary force said in an emailed statement. "Operations have now shifted to recovery efforts," the statement said. "The next-of-kin for the three missing Marines have been notified." The MV-22 Osprey "had launched from the USS Bonhomme Richard (LHD 6) and was conducting regularly scheduled operations when the aircraft entered the water," said the Marines. The unit was in Australia as part of a regularly scheduled deployment. The "ship's small boats and aircraft from the 31st Marine Expeditionary Unit and Bonhomme Richard Expeditionary Strike Group are conducting the search and rescue operations," tweeted III Marine Expeditionary Force, based in Japan. NPR's Scott Horsley reports that President Trump has been briefed on the incident by his Chief of Staff John Kelly. The MV-22 Osprey is a combination aircraft, says its maker Boeing, with helicopter-like rotors allowing it to hover; once airborne, it can convert to a fixed-wing plane capable of high speeds and altitudes. Saturday's incident comes a few weeks after a Marine Corps refueling aircraft crashed in Mississippi, killing all 16 people aboard. This is a developing story. We will update as the situation develops.